AMANPOUR: This week, Osama bin Laden as we've never seen him before, a new window into how he lived and how he died. OBAMA: Justice is done. The world is safer. AMANPOUR: But is it really? (UNKNOWN): Al Qaida was plotting -- the target was passenger trains. (UNKNOWN): There's a real concern about retaliation. AMANPOUR: We'll ask the president's national security adviser what's being done to keep Americans safe. Will clues from bin Laden's compound thwart future attacks? Or will Al Qaida strike back? Then, tough questions for Pakistan. Did America's ally harbor the world's most notorious terrorist? Our top correspondents covering the story all week bring the latest developments from Pakistan to Afghanistan to right here in the United States. ANNOUNCER: Live from the Newseum in Washington, "This Week" with Christiane Amanpour starts right now. AMANPOUR: Welcome to the program. This week, the whole world was transfixed by a single story. The headlines said it all: Osama bin Laden, the most notorious terrorist in history, shot and killed by American forces. The horror that he inflicted left an indelible mark on the American psyche. And behind me, the twisted and now mangled antenna that once stood on the north tower of the World Trade Center, here at the Newseum for all to see and remember what happened there. President Obama visited Ground Zero this week, closing a chapter in American history nearly 10 years after the 9/11 attacks. This, as the flood of information from the raid on bin Laden's Pakistan compound continues to pour in. And just yesterday, new tapes with extraordinary images of the terror mastermind seen as a graying old man watching himself on television. That was one of five videos released by the Pentagon, and now ABC's Martha Raddatz here who's followed the story every step of the way. RADDATZ (voice-over): Of the five videos released by the Pentagon, this one is surely the most compelling. There sits the most wanted terrorist in the world covered in an old blanket with a very gray beard watching news clips of himself on television. He switches his satellite TV from channel to channel. When an image pops up showing him with weapons, he motions to his camera operator to zoom in. What he is watching on the television matches a press conference we found in late January 2010. The other four tapes are all outtakes or messages to his followers. The audio has been removed by the U.S. because officials say it is jihadist propaganda. But notice the color of his beard. He clearly has been dying it. This is 2004. Similar clothes in background. This is the more recent tape. PILLAR: This is someone who realized that the image that he conveyed was the main value he had to his movement. It was part of his brand. RADDATZ: But last Sunday, the dye had faded. When he was shot dead by SEALs, the beard was gray. The tapes are only a small part of the massive amounts of intelligence picked up the SEALs in the compound, which intelligence analysts are calling the largest intelligence haul ever from a senior terrorist. AMANPOUR: ABC's Martha Raddatz. And she'll join me with our other correspondents in our roundtable in just a moment. So is that new trove of information revealing fresh dangers for Americans around the world? I put that question to the president's national security adviser, Tom Donilon. AMANPOUR: Mr. Donilon, thank you for joining us. AMANPOUR: Firstly, the pictures that have just come out. You've seen them. What do they tell us that we didn't know about Osama bin Laden? DONILON: I think the principal thing to take away is that he was engaged not just in being a symbolic leader of Al Qaida, but he was involved in the strategic and operational leadership. And let me say just a couple of things about this. Number one, the information was recovered as part of the operation of Sunday night, in addition to taking out Osama bin Laden on Sunday night, our special forces who are trained in this area gathered up as much information as they could before they left the compound. AMANPOUR: How would you describe it, in terms of its largeness? DONILON: I've say two things about it. It's the single largest cache of information that we've gotten from a senior terrorist, number one. And, number two, the CIA is describing it to us as the size of a small college library. AMANPOUR: Have you found any imminent threat right now, anything that should give concern right now that you're working to counter and neutralize? DONILON: I don't have anything to tell you this morning. But as we -- as we develop those, obviously, we'll go about the notifications in the appropriate way. AMANPOUR: Because Al Qaida has said we accept that he's dead and we're going to avenge that. Is there any worry, any fear, any plan that you know of? Are you taking any specific measures to counter any imminent threat? DONILON: Well, we've thought about that a lot prior to the -- prior to the action. And what I can tell you is this. And the president said it in his address to the nation on Sunday night. This is the most significant achievement we've had in our efforts against Al Qaida. At the end of last year, we assessed and made public this assessment that the pressure in Al Qaida had driven them to the point where they were as weak as they had been at any time since 2001. This is a really serious blow to them. It's a milestone on our way to strategic defeat. Having said that, we need to remain vigilant, and we will remain vigilant, and we certainly had thought about that a lot prior to the actions that we took on Sunday. AMANPOUR: Let me ask you about the killing of Osama bin Laden. What was the nature of his resistance? DONILON: He didn't surrender, right, and moved away from our forces, right, you know? And at that point, he's a threat to our forces, given the techniques that we know, and our forces made an absolutely, absolutely appropriate judgment. AMANPOUR: Let me ask you this, though, because it goes to the central part of the story. The success of this mission, you had to, you know, sort of correct some of the -- some of the story lines at the beginning. You've said that the president went down and had an A-to-Z conversation with the special forces. Do you think, in retrospect, would you have done it differently? Would you have allowed that complete briefing of the people who had done it before giving out information? DONILON: As you know from covering many of these events, initial reports can sometimes be inaccurate, right, and need to be corrected. And as soon as the information was refined and was corrected, the administration put that out. You know, when I looked at the picture the other day, the famous picture now of us in the Situation Room -- looked at it yesterday -- I was -- I tried to reflect on it a little bit, and my eyes went to the president. And we ask a tremendous amount of our presidents, including these kind of decisions. And this -- you know, a week ago Thursday evening, he got his last briefing on this in the Situation Room. And he got divided counsel, frankly. DONILON: Absolutely. As you would expect. DONILON: Divided counsel, people recommending different options. AMANPOUR: Because it's been written (ph) dissension amongst the ranks. DONILON: I wouldn't call it dissension. I would call it -- I would call it -- I would call it a divided counsel, that people had -- were in favor of different options. And I've served three presidents, as you know. And you watch the president take this in. He chaired five National Security Council meetings in six weeks. Take all that in, say, I'm not going to make my decision now, I'll tell you my decision tomorrow, stand up, walk out of the Situation Room, go down that colonnade that you know so well by the Rose Garden to his residence, and make that decision. And this is what we ask of our president. And I think in this case the president was well served by the process, and we're well served by his decision. AMANPOUR: As you know, there are many in the Republican Party, many former Bush administration officials -- the attorney general of the Bush administration wrote in the Wall Street Journal that, quite frankly, it was the Bush policies that led to this success, that the enhanced interrogation methods were pretty much the thing that led to you all finding Osama bin Laden, and that President Obama's decision to do away with enhanced interrogation will mean that it will be very difficult, if at all possible, to get these kinds of intelligence again. So do you think then that it's -- you should reinstate harsh interrogation? DONILON: No. And, in fact, I can't really and won't, frankly, get into specific pieces of intelligence that led to the raid on Abbottabad. But what I will say further, though, is this, is that no single piece of intelligence that was gathered many years ago or in the interim, no single piece of intelligence led to this success. It was hundreds of pieces of intelligence. And that's how these cases are put together, as you know, over time. And it was across two administrations. When President Obama was told that our forces were safely back in Afghanistan, the first person he called outside the White House was President Bush. AMANPOUR: ... Leon Panetta, we've heard others say, I mean, they were either incompetent or they were involved, we didn't tip them off because they would have tipped off the target. I mean, what are you going to do to restore and to -- to fix this relationship? AMANPOUR: ... do you believe that elements of either the government or the military or the intelligence knew and harbored Osama bin Laden? DONILON: Let me address that directly. As I sit here with you, I don't have any information that would indicate foreknowledge by the political, military, or intelligence leadership in Pakistan, point one. AMANPOUR: It was their West Point town. DONILON: Yes, yeah. So questions -- and these questions, as you know, are being raised quite aggressively in Pakistan. AMANPOUR: Well, what are you demanding of them now? DONILON: Yeah. And they indicated -- and out of the core commanders' meeting that General Kayani had this past Thursday, have indicated they're going to do an investigation. They need to do an investigation. AMANPOUR: But can you deal with these very people who you've had to deal with? DONILON: Well, let's go -- let's go through that, yeah. I think that -- I think, though, on this issue, we need to work with them on a couple of things. First of all, we need to know how this happened and they need to know how this happened, if they weren't involved, right? They need to know how this happened. Secondly, we need to work with them on assessing all the evidence out of that compound and all of the evidence associated with Osama bin Laden's presence there for six years. They have in their custody all the noncombatants from the compound, including three wives of Osama bin Laden. We've asked for access, obviously, to those -- to those folks. They took additional materials. We talked to them first about the materials that we had. They had additional materials. We need access to that. But I would be remiss if I didn't make another point. More people have died, right, more terrorists have died -- have died and been captured, excuse me, on Pakistan soil than any place else in the world. They have been an essential partner of ours in the war against Al Qaida and in our efforts against terrorism. And that really can't be dismissed. This is an important relationship with the United States, so we need to assess this, Christiane, in a cool and calm way. And my job as national security adviser is to do this in a way that advances our interests. AMANPOUR: If today the president had to make that decision to go after Zawahiri in Pakistan, would you tell the Pakistanis? DONILON: Well, we'll have to look at the specifics of the operation. This really wasn't a matter of trusting or not trusting; it was a matter of operational security. AMANPOUR: So would you do this again, then, in Pakistan, go in without telling them? DONILON: It would depend on the operation, right? It would depend on the risk assessments, right? We do many, many joint operations with the Pakistanis. This was a singular operation, a very unique operation, indeed, the most important military operation that we've undertaken in a long, long time. AMANPOUR: I have to ask you a final question. AMANPOUR: ... as a huge milestone on your mission to defeat Al Qaida. AMANPOUR: Your Afghanistan policy is about defeating Al Qaida. AMANPOUR: Does this mean that you will withdraw more troops? AMANPOUR: Because people are saying that now. DONILON: Yeah. Yeah, I understand. It is a -- it's an important milestone toward strategic defeat and it's an important step towards our achieving our goals. And the president has laid out quite clearly and worked with our allies on this that we'll begin a withdrawal in July of X number of troops. AMANPOUR: Will you bring more than you had expected? DONILON: We haven't made those determinations yet, is the absolute honest answer. AMANPOUR: Thanks so much for joining us. AMANPOUR: And you can find more of that interview with Tom Donilon, the national security adviser, online, including about the way forward in Libya. AMANPOUR: But right now, as we've been saying, America's alliance with Pakistan has never been before so severely tested, and so we're going to ask directly now the Pakistani ambassador to the United States, Husain Haqqani. You heard what National Security Adviser Donilon said. They have no evidence that anybody in your camp knew. But I want to know, do you categorically deny that any member of the government, the military, or the intelligence had any notion or was harboring Osama bin Laden? HAQQANI: If any member of the Pakistani government, the Pakistani military, or the Pakistani intelligence service knew where Osama bin Laden was, we would have taken action. Osama bin Laden's presence in Pakistan was not to Pakistan's advantage. You know Pakistan well, Christiane. You were there immediately after 9/11. We still have many jihadi has-beens from the 1980s who are still alive and well and kicking, and some of them could have been helping them, but they are not in the state or government of Pakistan today. AMANPOUR: Right, but let's call a spade a spade. Osama bin Laden, number-one terrorist in the world, including against Pakistan, was hiding in your West Point town. There are barriers, there are checks. Foreigners just can't go there just willy-nilly. I know that for a fact, and so do others. Khalid Sheikh Mohammed, KSM, was found in a similar garrison town in Rawalpindi a few years ago. How can this happen without the tacit knowledge or without some kind of involvement? HAQQANI: Let me proffer another explanation. AMANPOUR: But that's the question. HAQQANI: Yeah. It's a state, it's a country with lots of people. It's a very difficult country in the sense of its capacity to deal with the problems. As the national security adviser said, a lot more people have been arrested in Pakistan, including Al Qaida people, than in any other country. So Pakistan did not have a policy of protecting these people. However, the United States spent much more money in Iraq than it did in Afghanistan. And then it spent much more money in Afghanistan than it did in Pakistan. So were there cracks through which things fell through? Absolutely. And we'll investigate that; we'll get to the bottom of it. AMANPOUR: All right. You've said that it's time for Pakistan to wake up. Is there going to be a credible investigation that leads to some heads rolling? National security adviser said that the chief of the military, General Kayani, was holding an investigation. Tell me where that investigation stands. HAQQANI: General Kayani, of course, as you know, is an honorable soldier who is very different from those in Pakistan who in the past have used their military position to try and make coups. The coup-makers have different worldviews than General Kayani. He and other soldiers, professional soldiers, are as concerned about this as you and I and. And, therefore, there is an investigation ongoing. It's premature for me to reveal the details of it. But that investigation will lead wherever it will lead. HAQQANI: And heads will roll, once the investigation has been completed. Now, if those heads are rolled on account of incompetence, we will share that information with you. And if, God forbid, somebody's complicity is discovered, there will be zero tolerance for that, as well. Remember that President Obama himself said the government of the United States is very clear that President Zardari, Prime Minister Gilani, the chief of our army, they were certainly not amongst the people who should have been accused. AMANPOUR: All right. But let me ask you this, then. You have -- you've heard and you know that you have access and in custody the three wives of Osama bin Laden, the noncombatants who were found there, children included, and a lot of material. Are you interrogating them? What are they telling you? HAQQANI: Well, we are learning things about the lives that they were leading. Obviously, it's not very easy to interrogate small children, and certainly the wives, also. HAQQANI: For example, we understand that one of the wives never left the same floor as Osama bin Laden because they were paranoid about physical movement. They didn't go to windows. They didn't have any sort of fresh air, so to speak. So all these people are, of course, being interrogated, questions being asked. Pakistan wants to put to rest any, any misgivings the world has about our role. Be clear: We have been victims of terrorism, and we will see this through, and we will share all intelligence with everyone that we have to share this intelligence with. AMANPOUR: Precisely, therefore, will you give them -- you talk about sharing intelligence -- will you give the United States access to them, as Mr. Donilon just asked for and they want? Will they have access to the wives and the material? AMANPOUR: So that's a yes? HAQQANI: He will tell you the role of Pakistan. Let's be honest. Pakistan has a complexity in its society. We have people -- if you do political opinion surveys, there are people who have sympathy with the cause of Osama bin Laden. Those of us who do not, we are targets ourselves, so we have to deal with that complex ground reality in Pakistan. It's not easy for us. AMANPOUR: This is -- you know, we hear very diplomatic words from you, but we hear rather a lot of bluster from Pakistan, in fact. General Kayani, even the head of the ISI has said that this must never happen again. If the Americans try it again, we'll take action. They're not being as -- as conciliatory as you. If the United States had to go in again and do it, would that be fine by you? HAQQANI: These are two separate questions. One is, are we comforted by Osama bin Laden being taken out? We certainly are. Our president said that; General Kayani said that. Nobody said that we didn't want Osama bin Laden taken out. What we are offended by is the violation of our sovereignty. Now, we've heard the American explanation. But at the same time, try and put yourself in the position of a Pakistani leader who has to go to votes from the same people who will turn around and say, "You know what? You can't protect this country from American helicopters coming in." America has a selling job to do in Pakistan, too. Convince more Pakistanis that you are more of our ally and, therefore, there would be less offense. HAQQANI: Absolutely, and we are working on it. Both sides are engaged. The fact remains that in future we want to make sure that we continue with joint operations. As far as high-value targets are concerned, the Americans are sharing with us what they think is the way forward. We are giving our opinions. But, look, Christiane, complaining and carping about Pakistan has been around for as long as the Pakistani and U.S. alliance has been around. There have been demonstrations in Pakistan for a long time. There have been objections in Congress for a long time. But we are allies and partners who need each other. And so, let's be fair, people like me sitting quietly with people like Tom Donilon are the ones who are going to find that way forward, not the people screaming on television, either in Pakistan or on the late-night shows here. AMANPOUR: We'll keep tracking it. Ambassador Haqqani, thank you very much, indeed, for joining us. AMANPOUR: And up next, is the United States bracing for Al Qaida's revenge? We'll get the latest information from our team of ABC News correspondents. MEYERS: The White House on Tuesday revealed that Osama bin Laden was not armed when Navy SEALs found him, but they say he did resist them. Hey, White House, armed, unarmed, not resisting, holding a bunny, we're totally cool with you shooting bin Laden. AMANPOUR: "Saturday Night Live" echoing public opinion on the story of this week, a story that's far from over. President Obama, of course, has ruled out releasing photographic proof of bin Laden's death, but one key constituency seems to need no convincing. Al Qaida acknowledges their leader is no more and vows revenge on Americans. So joining me to assess the threat and take stock of this incredible week, the ABC correspondents who've been covering this story: senior White House correspondent Jake Tapper, chief foreign correspondent Martha Raddatz, and justice correspondent Pierre Thomas. Thank you all. What a week it has been. I want to go to you first, because everybody is worried about this so-called treasure trove and what it might be telling us. We've tried to get from Donilon and from Haqqani exactly what is out there. Is there anything out there that we should be worried about right now? THOMAS: There's no specific imminent threat that they've found. But I can tell you what they're most concerned about. Right now, the most immediate threat they are worried about are so-called lone wolves, people who've been typically radicalized on the Internet who have been sympathizing with Al Qaida, those are the people who might show up at a mall and start shooting. So that's the first level of threat. AMANPOUR: The underwear bombing plan. THOMAS: ... underwear bombing, and then they followed it up nine months later with the parcel bomb attack out of Yemen, as well, so the concern is that they will try to do something very quickly. The third level of threat is Al Qaida central, but right now they think that those leaders are running for cover, literally. AMANPOUR: So, Martha, Awlaki in Yemen. There was a missile strike this week. Are they actually trying to get him? And do they know where he is? RADDATZ: I think there was not a link between the intelligence they gathered in Pakistan from bin Laden's compound and the strike on Awlaki. RADDATZ: Too soon. I think you just can't get it that fast. They had troves of this to go through. So I don't think that had anything to do with it, but it shows you how aggressive they are being in Yemen now. They've increased the number of drones. They've armed the number of drones. That was a military drone strike. They just missed him. So as much as they would like to get on the map right now, I'm sure Awlaki is completely running scared. AMANPOUR: And, Jake, the White House, this has been a massive success for President Obama, for American intelligence. What is the next thing on their agenda? What are they thinking about right now in terms of what they found, of what they need to do going forward? AMANPOUR: ... and not defensive? TAPPER: ... absolutely, so that they work together. Let's work together so that we can, for once and for all, defeat Al Qaida, and that is the approach being taken. AMANPOUR: I mean, we've heard Ambassador Haqqani talk about that, and everybody is saying that they have suffered so many deaths, as well. But, you know, for years it seems they've been speaking out of both sides of their mouth. AMANPOUR: So what can the administration do to end this, to stop this? TAPPER: Try to convince behind the scenes the Pakistanis that they have to stop this. But there is very little sense in doing it in a public way so that the Pakistanis feel like they have to. I mean, just remember all the diplomacy behind the scenes going on when the CIA contractor, Ray Davis, was in prison. There is a big difference between what is said publicly and what is said privately. And what is said privately right now is different than the public message. But the idea is, we need to do this together, now's the time to stop double-dealing. RADDATZ: And we really need them more than ever. As much as you can tell them what to do -- and we've been telling them over and over and over, you've got to do more, you've got to do more, it is still a fine line. The Pakistanis are embarrassed right now. They're embarrassed that they found bin Laden right under their noses. But we need them. AMANPOUR: Because of the war in Afghanistan. RADDATZ: We need them to -- but we also need them in Pakistan. This is not over. We need the intelligence. Whatever they provided in the past, they have to keep doing that. THOMAS: But, Christiane, this is so complicated. I had a senior official talk about the fact that there's evidence that's going to come out of a trial, federal trial in Chicago, that will show or suggest strongly that the Pakistani intelligence, the ISI, had a role in the Mumbai attack. So there are going to be serious questions raised about, how much can we really trust them? TAPPER: Not just -- and not just that the ISI had a role in the Mumbai attack, but the ISI was behind the Mumbai attack, specifically the idea of targeting Westerners and targeting the rabbi that was killed there in the Lubavitch Center was an American rabbi, and the idea that the ISI was behind that, and that -- this is the David Headley case. This is going to be very important. THOMAS: And two things to point out. The Times Square bombing originated Pakistan. The attack that they were planning on the United States 2009, September 14th, around the anniversary of 9/11, also originated in Pakistan. AMANPOUR: So tell me, Pierre, about the -- you were talking about the lone wolf, but also about what seems to have come out, that Osama bin Laden was very interested in not just financial and other warfare against the United States, but class warfare, racial tensions, stirring that up, as well. THOMAS: I spoke to officials Friday who were just stunned at the level of expertise and thoughtfulness that bin Laden and Al Qaida put into how to break down the American society, not just to kill people. They talked about ways in which to recruit minorities to do some of these attacks, the notion to get Americans thinking about each other, looking at each other in strange ways, so that was part of the plan, as well. AMANPOUR: And, Martha, let's go back to those pictures, unbelievable pictures. RADDATZ: Incredible, incredibly compelling, watching this old man sit there huddled in that old blanket, watching himself on television. AMANPOUR: It really beggars belief that he was so intimately involved, as we're now being told. Why do they -- do you know what they might have -- the audio they might have silenced? Do you have any reporting on what that audio that his last message was going to say? RADDATZ: Well, I think -- I think his audio on all those were generally the same as they've always been. It's a jihadist message. It's, "Attack America. America is bad." So that was generally the same. I think what's extraordinary -- and we talked about this a little earlier in the piece about dyeing his beard, how important his image was to him. I mean, that little den you saw there was a command-and-control center. He was involved strategically, tactically, operationally. That's new information. I mean, you remember President Bush saying, oh, we don't even worry about him anymore. I mean, for years and years and years, they thought he was hiding in a cave, really not running this organization, and he clearly was. THOMAS: One official called him the head coach. AMANPOUR: The head coach, indeed. RADDATZ: A really nasty coach. AMANPOUR: What was the most startling, revealing bit of this story all week? What was the most significant? TAPPER: Our livelihoods depend on it. TAPPER: ... General Petraeus did not know. AMANPOUR: Until just before, right? TAPPER: If I could say one other point, because you asked the ambassador about this. The reason why the U.S. did not tell the Pakistanis about this mission is the same reason why the U.S. doesn't tell the Pakistanis before Predator drone attacks: because they will tip off the bad guys. It was U.S. policy to alert the Pakistani government before a drone attack. That changed in the Bush administration. That changed, because they couldn't trust them anymore. RADDATZ: Yes, trust and operational security are the same thing. AMANPOUR: The most extraordinary thing for you? RADDATZ: How little security bin Laden had around himself. And just one little detail. My favorite detail of the week was that the SEALs didn't have a tape measure with them, and Osama bin Laden is six-foot-four. So one of the SEALs had to lie down next to him to try to figure out how tall he was. AMANPOUR: President Obama apparently said, we spent $60 million on a helicopter, but we couldn't buy a tape measure. THOMAS: Two things. One, a young person said the notion that Osama bin Laden was chilling out in the 'burbs of Pakistan was just amazing. I think the other thing that struck me was this notion of the students coming out and celebrating outside of the White House. It was a reminder of how 9/11 put a dagger in the heart of this country and that a lot of people thought that retribution was deserved. And when they got it, they expressed it. AMANPOUR: And how we had all been living with this for so long. Jake, Martha, Pierre, thank you so much, indeed. And up next, Condoleezza Rice with a stern message for Pakistan. AMANPOUR: As we heard from Tom Donilon, George W. Bush was the first person outside the White House to be informed of Osama bin Laden's death. The former president was invited, but declined to attend Thursday's ceremony at Ground Zero, but his closest aides were breathing a very public sigh of relief this week. I spoke with former Secretary of State Condoleezza Rice about this milestone and about America's newly fraught relationship with Pakistan. AMANPOUR: Pakistan, did they just mess up? Are they just completely unreliable, clueless? RICE: Well, I have to say that the biggest surprise in this for me -- I was not surprised that we got him. I knew we would eventually get him. I was surprised where we found him. The idea that he could be in a suburb, essentially, of Islamabad is quite remarkable. And so Pakistan has some very hard questions to answer, and this isn't a time for bluster from Pakistan. AMANPOUR: You say you were surprised that he was found in that suburb. And even last year, Leon Panetta told ABC, the director of the CIA, that he thought that bin Laden was in a cave. This cave of mythology became conventional wisdom. AMANPOUR: Did you really think that? AMANPOUR: That he was in this cave? RICE: Yes. Yes, we really did, or in a tribal area. Remember, the tribal areas are not just caves. There are villages in the tribal areas. And so there was some sense that he might be protected within one of the villages, which were fairly hard to get to and fiercely protective of their sovereignty (ph). And so I think the cave was a bit of a metaphor for where he was. AMANPOUR: Who is it who's responsible for not knowing that Osama bin Laden is hiding right there in a military base, just about? RICE: Well, I think it is entirely possible -- and I think probable -- that high-ranking people didn't know. But if this happens in your country, you have an obligation to find out and to do a thorough investigation and to punish anybody who might have been responsible. That would be a very important message. I remember going to Pakistan shortly after the Mumbai bombings. And I remember saying to the chief of staff, to the prime minister, to the president, what happened in Mumbai had to have had support of the sophisticated apparatus of Pakistani military and intelligence. It had to have. And so don't hide behind the fact that you don't know or you don't believe it. That's the kind of conversation that I think needs to take place with Pakistan right now. 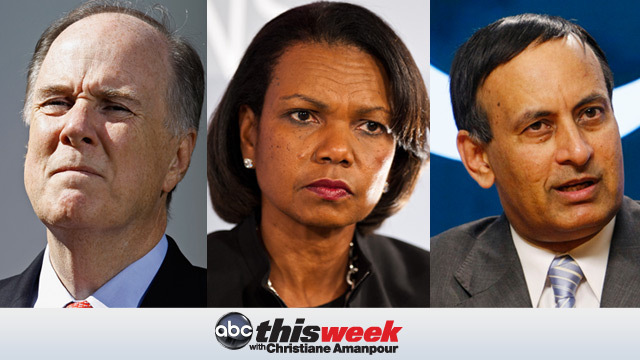 AMANPOUR: You can find more of that interview with Condoleezza Rice at abcnews.com. And so what does the future hold for America and Pakistan? Joining me to tackle that one, our powerhouse roundtable, ABC's George Will, Liz Cheney, the former deputy assistant secretary of state and co-founder of the group Keep America Safe, Tom Ricks, who writes the Best Defense blog for Foreign Policy magazine, and Lawrence Wright of the New Yorker, who tracked the rise of Osama bin Laden and Al Qaida in his book "The Looming Tower." Thank you all for joining us. Clearly, the story of the week is bin Laden is dead and Pakistan is in the hot seat. Around the table, who is shocked and horrified to think that Pakistan is saying it didn't know? And who really believes that Pakistan didn't know? WILL: Well, neither, in this case. Pakistan we knew going in is a house divided against itself. And as Americans know, a house divided against itself must become one thing or another eventually. And the question is, how is there -- is there close to a tipping point? Is it more healthy than unhealthy? That's a question we have to answer. But the stakes are enormous. We're in Afghanistan only because of Pakistan. If it weren't next door to Pakistan, we wouldn't be there. CHENEY: Well, I think that it is surprising that he was 35 miles from Islamabad. I think it's unclear whether anybody in the Pakistani government was supporting him, was helping him. We've had some administration officials suggest it's impossible that bin Laden could have been there for this long without some kind of a support network. But I do think it's very important, as we hold Pakistan accountable, as we push them hard for the names of anybody in the ISI who may have been in contact with bin Laden, that we not forget, you know, George's point about the stakes, that we cannot afford to walk away. We walked away once at the end of the 1980s, and we saw what happened. We cannot afford for Afghanistan to become a safe haven. We can't afford for Pakistan to become a safe haven, with over 100 nuclear weapon, 170 Muslims (ph). I think it's very important that we deal with this relationship in a very well-advised way going forward and not jump to the conclusion that we've got to walk away. AMANPOUR: Tom, you have a different point of view on this. RICKS: I do, and I'm actually kind of surprised to find myself to the right of Liz Cheney. CHENEY: It's a very nice place to be. RICKS: I actually think we're going to have to see a major change in U.S.-Pakistani relations. This game of Charlie Brown and the football that we've played with them for decades, I think the jig is up. I don't think the American people will stand for it. I think the elites in Washington, the administration, Congress, and Liz Cheney, I think, are behind the mood of the American people or trailing the mood of the American people. I don't think Congress is going to stand for giving $4 billion a year to a country that is acting like an enemy. AMANPOUR: Lawrence Wright, I think you feel somewhat the same way. But to play devil's advocate, doesn't Pakistan kind of have the U.S. over a barrel? It does have all those nuclear weapons. It does and remains instrumental to what's happening in Afghanistan. How can the U.S. extricate itself from Afghanistan without Pakistan? WRIGHT: It is kind of nuclear extortion, is something we're going to have to deal with for the rest of our history. And we're already seeing in North Korea. That's our relationship now in Pakistan. WRIGHT: ... Iran. They opened up negotiations with Al Qaida in 1998. So the things that we're worried about have already -- our money isn't protecting us. Our special relationship with Pakistan hasn't provided any immunity from that kind of behavior. AMANPOUR: What do they need to do? We asked Ambassador Haqqani. We asked National Security Adviser Donilon. What actually do they need to do that will satisfy the United States and that will create a real change in behavior? CHENEY: You know, we saw in the immediate aftermath of 9/11, when the U.S. government really gave them a choice and said to them, look, you need to decide where you're going to line up here, and I think that it's important that the Pakistanis understand the message that the American people are demanding to know that now. Nobody is happy with the fact that bin Laden was captured, was killed inside Pakistan. But I think that those things that Larry and that Tom mention as concerns will be more of a concern if we simply walk away. If you have an extremist government, for example, take over in Pakistan -- and they actually control that arsenal of nuclear weapons -- that's clearly not in America's interests. So we've got to stay engaged. AMANPOUR: Let's talk about Afghanistan. Even before this death, some two-thirds of the American people were no longer supporting the war in Afghanistan. As you've heard, so many people are saying now you've decapitated the snake, it's time to get out of Afghanistan. How long do you think that will last or will that grow, those calls to reduce in Afghanistan? WILL: Well, it's our longest war now, it's 10 years old, longest in our national history. Do the arithmetic. There are 140,000 coalition forces there. There are at the top estimate about 100 Al Qaida fighters there. That's 1,400 soldiers at a million dollars per a year, $1.4 billion per Al Qaida fighter. The arithmetic doesn't make sense. The point is, we're not in there for Al Qaida. We say we are, but we're not. We're there because we think in some sense this is crucial to the stability of Pakistan, about which we wouldn't care half as much as we do if they didn't have nuclear weapons, so it all comes back to that. AMANPOUR: So what -- you've been a lot to Afghanistan. How does one get out of there? And does the death of bin Laden significantly affect the war there? RICKS: As a matter of fact, I used to be in the ski patrol in Afghanistan when I lived there. I think what you can do is go the way that Vice President Biden has been talking about for a long time, which is go from a conventional footprint of 140,000 troops down to a much smaller footprint of about 20,000 special operators and support troops. If you do that, you remove the ability of Pakistan to extort from us because they stand on our supply line. You can't supply 140,000 troops by air. You can supply 20,000 by air and through Central Asia. AMANPOUR: And, Lawrence, we've been talking a lot about and trying to get our heads around how devastated is Al Qaida by the death of Osama bin Laden. Is it still a force? WRIGHT: It's still a force, but it's at a mortal moment. It was already in trouble. It had divided leadership. It was under -- in hiding, obviously, but the -- inside Al Qaida, there's going to be a struggle, because Ayman al-Zawahiri, the number two and the guy who's likely to be the successor, is a very polarizing figure and he's anti-charismatic. He doesn't have any of the mystique that bin Laden had. There are all these affiliate, though, that will continue to run under the Al Qaida flag, but basically most of them have nationalist agendas, not international, as Al Qaida central had. And I suspect you'll see a lot of centrifugal force pulling those organizations away. AMANPOUR: We'll take that up in the next bit of our roundtable. And up next, what is Al Qaida without Osama bin Laden? Our roundtable tackles the new threat and whether waterboarding should return to the American playbook. OBAMA: Tonight, I can report to the American people and to the world, the United States has conducted an operation that killed Osama bin Laden, the leader of Al Qaida. Good job, national security team. Thank you. Yeah, I'm proud of you. You guys did a great job. AMANPOUR: Images released by the White House behind the scenes as the president and his top aides react to the death of Osama bin Laden. Up next, I'll ask our roundtable whether his death gives new life to the argument over harsh interrogation of terror suspects. AMANPOUR: Obama administration officials acknowledged this week that, yes, techniques like waterboarding did, in fact, yield fruitful information in the hunt for Osama bin Laden. Still, they question whether that same information could have been obtained through other means. This week's events have reignited this heated debate. So what do you think? Should they come back again, these interrogation techniques? Because even Leon Panetta said some of these suspects had been interrogated in that way. RICKS: I never thought I'd live in a country where we would debate whether we should endorse torture as an official policy. Was some information obtained through torture? Probably yeah. Could it have been obtained through more professional methods the intelligence professionals recommended? Almost certainly yes. We could have gotten it sooner and better. Also, what we know is that the use of torture became the prime recruiting tool for Al Qaida and for insurgents in Iraq, and so directly resulted in the death of American troops. AMANPOUR: Liz, does this reignite this debate as to whether these enhanced interrogation techniques work and should be brought back? CHENEY: I think it does. I think the fact that you clearly have the current CIA director saying that part of the intelligence came from enhanced interrogation, it's important to remember, you know, Chip Burlingame, who was the pilot on American Airlines Flight 77 that flew into the Pentagon, he himself was subjected to these techniques when he went through SERE training. These are not torture. These are techniques that we know work. That debate is over. It worked. It got the intelligence. It wasn't torture. It was legal. It seems to me the key question now is, we've got this trove of intelligence, what looks to have been perhaps the biggest trove we've ever been able to get a hold of. If that leads us to other Al Qaida operatives, it's not clear to me that we have any way to effectively interrogate them. We don't have enhanced interrogation anymore. We read people their Miranda rights. We are not detaining people at Guantanamo anymore. We're not detaining people in the secret prison sites. It's not clear to me what the administration will be able to do to get this information. AMANPOUR: George, what do you think it says about that policy? And what does this death of bin Laden, what they seem to have found right now, say about what he was planning, what Al Qaida was planning? WILL: Well, with regard to enhanced interrogation, it's an unanswerable question, could we have got it another way? Perhaps yes. We don't know. We know that we got it in part using enhanced interrogation. So going forward, that's another matter. What it tells us about Al Qaida, Al Qaida had this vaulting ambitions, a caliphate from Indonesia to Spain. Now, with the waves of modernity sweeping the Middle East, there sits this old man with a TV remote, and the New York Times reported early on that one of the notebooks, handwritten in his handwriting, I gather, his project was to derail an American train on a bridge, perhaps coinciding with the State of the Union address. You don't build a caliphate derailing American trains. It's a pathetic ambition. AMANPOUR: So are they kind of pathetic? I know everybody is worried. People want to know whether there are any real threats to American interests and other interests out there. Was Osama bin Laden really, really the mastermind still, as the narrative is telling us right now, organizing, operating? WRIGHT: It's very hard to imagine that in that compound where you see how pathetic it was and how carefully controlled the entry was to have it as a nerve center. It seems -- it stretches the imagination. I think the fact is, Al Qaida hasn't been able to operate very well for the last eight years, and bin Laden has probably not been an influence. I think that, really, the organization has been running more or less without him, and not running very well. AMANPOUR: And let's talk about George's point. You know, the Arab Spring, the modernity that's sweeping the Islamic world, is that the death of bin Ladenism? Is that what we're looking at, killing his dream, basically? CHENEY: I think I was struck as George was. You know, if you think about the incredible information revolution and the fact that you've got, you know, young people standing in Tahrir Square holding up a smartphone saying, you know, this is my weapon, juxtaposed with bin Laden sitting, you know, with a little teeny television set with wires coming out of it, it looks like 1970s technology. What's happening across the Arab world, I think, does begin to signal the end of Al Qaida's aspirations. I think it's too soon to say that they've been diminished as a threat. Certainly, Al Qaida in the Arabian Peninsula, al-Awlaki are still threats, still attempting to attack the United States. But the Middle East and the Arab world seem to be moving on, and bin Laden's death certainly is part of that. AMANPOUR: Tom, what do you think about where the real people are going? Are they ripe for recruiting as everybody feared before? RICKS: No, I think Lawrence's sense that they are an organization with a past is correct. I was struck recently looking at a poll done in Yemen and found Al Qaida was more popular among older people, 30s, 40s, 50s, than it was with people in their teens and 20s. AMANPOUR: That is one of the remarkable things. In all these countries where Pew has taken a recent poll, both bin Laden himself and Al Qaida's popularity has been plummeting. Last question to you, because you've been very critical of President Obama, and you suggest that he's been up to the task of national security. Would you take that back now? CHENEY: I still have big concerns about some of his policies, but I certainly think that America is safer, the world is safer when the message is, if you kill 3,000 American, the Navy SEALs are going to put a bullet in your head. So I would give President Obama credit for making that tough decision. AMANPOUR: On that note, thank you all very much. And up next, the toll that this one man has taken on the United States and the world. Sorrow and sacrifice by the numbers when "This Week" continues. AMANPOUR: We'll always remember where we are were on that terrible day nearly 10 years ago, and newspapers around this country and around the world told the story. But the real impact lies not in the headlines, but in the numbers: 2,976 people were killed on 9/11. Since then, twice as many American troops have died fighting the wars on terror, 6,002 servicemen and women. This week, the Pentagon released the names of five soldiers killed in Iraq and Afghanistan. And, of course, thousands of people around the world have also fallen victim to acts of terror sponsored, planned, and applauded by Osama bin Laden. I'll be right back with a closing thought in a moment. AMANPOUR: Today is Mother's Day. And as I stand before the twisted antenna of the Twin Towers, I'm struck by what children have told me about that terrible morning, children who are visiting this exhibit. They spoke of their mothers, some standing strong, others dissolving into tears on that day, 9/11, children as young as five with such vivid memories still. I also think of the mothers who were killed that day and in all the wars that have followed and of those who have been left behind to raise families on their own. Our thoughts are with all of them today. That's it for our program. For all of us here at "This Week," thank you for watching, and see you next week.